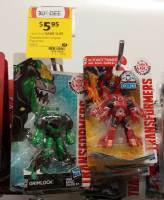 Thanks to fellow 2005 Boards member griffin-of-oz, we can report that Robots In Disguise Combiner Force Legion Twinferno Is Out In Australia. 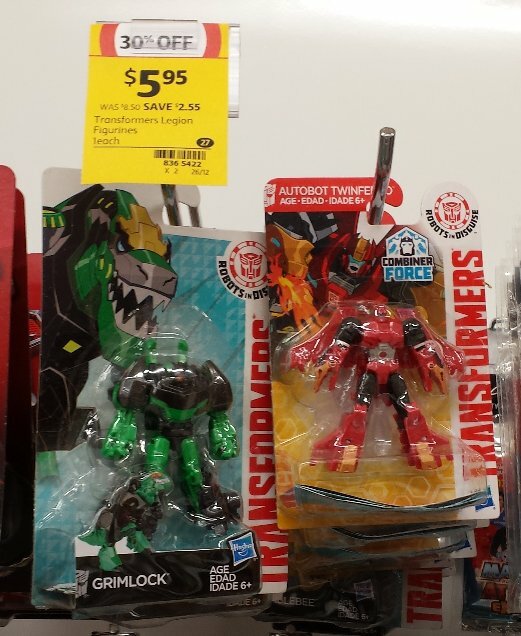 Twinferno was found at a Coles store in Brisbane and he is the only character on RID Legion Wave 13 and the last one for this class size for the RID line. Happy hunting for all Australian fans! It\'s never been confirmed he\'s the last and there are in fact rumors saying we\'ll get RID figures for the first three quarters of 2018. Though neither have been confirmed so it isn\'t safe to assume, though all TF toylines usually continue in the gap between shows. I saw Legion Cyclonus & Heatseeker in our retail outlets. Must be a royal shelfwarmer since the Twinferno case assortment contains Optimus Prime (original colors, "Combiner Force" packaging), Twinferno, Sideswipe (original colors, "Combiner Force" packaging) and Groundbuster ("Combiner Force" packaging). Original packaging Grimlock can't have been part of Twinferno's case because the packaging dimensions don't match. That store actually restocked with a case of that first wave just a week before restocking with the Twinferno wave. Wait, dem Aussies got the original, vintage Legion Grimlock? The last of the RID Legions – Twinferno – has now been found in Australia. With the last of the 1-steps and 3-steps out here last month, we just have the final pair of Crash Combiners to be released here, to mark the end of the Robots in Disguise toyline in Australia. Hmmm…. half jet, half dragon… does that make him a Fuzor. Noice find! Yet to see the cute little twin headed Dragon in Malaysian stores. Want. Good to see he made it. He's way better than the deluxe anyway, from what I\'ve seen. Can\'t wait to find him somewhere in Sydney.